For nearly 1,000 years the #minaret of the Great Mosque of Aleppo soared above Syria’s largest city. It now lies in ruins. The war destroyed what once represented the White city’s soul, one of the most ancient and great achievements of human history, culture, and knowledge. Today Aleppo is what Beirut, Jerusalem, Grozny or Berlin were yesterday. Everything is shifting, turning around us – and is remembered as the winning oppressors’ want. We experience the turmoil of human, social, religious, and political conflicts. A ‘big bazar’ of lost human values and brainwashed minds. We witness a sickening applause to extremism, conservatism, and fanaticism. What do we do when humans and cities, ideas and culture, the past and the future are being destroyed? Can we stop the war? Can we act, resist ‘numbing’, or have we become accustomed to the everyday dark news reports from this troubled region? Renowned Lebanese contemporary choreographer, Omar Rajeh has chosen Plovdiv to present a pre-premiere of his newest production #minaret. #minaret stands against the numbing, the non-acting position to the vast destruction and violations of human rights. #minaret is Rajeh’s new performance of resistance against the war “normality” and the abstraction of the violence for the ones watching both far away and nearby. He is among Arab star choreographers on the world’s contemporary stage with many European presentations and coproductions. He doesn’t want to scare us, or to impose on us a certain opinion. His performance focuses on the specific moment of questioning our position and where we stand. For that dance, art may initiate change. Especially in this troubled part of the world. Located at the crossroads of several trade routes from the 2nd millennium B.C., Aleppo, one of the greatest and oldest cities, has a central political and cultural significance for Arabic traditional and classic culture, especially in music. Aleppo’s faith is similar to that of other important Arab cities in the region, such as Baghdad, Damascus, Jerusalem, and Beirut which have been deprived of their roles, either through destruction, occupation, aggression, extremism, or poverty. These different cities that once were, each in its own way, the ‘minarets’ of the Arab culture have sunk into radicalization, ignorance, and reticence. Looking into the culture and heritage and ‘re-visiting’ it seems extremely vital these days. Not to evoke nationalistic ideas but to cherish human culture and values of openness, diversity, refinement, and tolerance, that once were at the forefront of a city such as Aleppo. 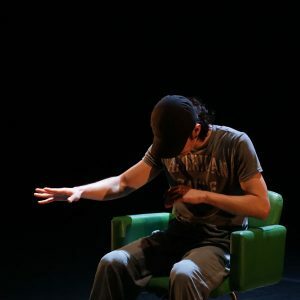 Omar Rajeh is a choreographer, dancer and artistic director of Omar Rajeh | Maqamat. He established his company in Beirut in 2002 after studying dance in Lebanon and in England. He has created 15 powerful performances and has toured throughout the Arab World and Europe, in addition to Canada and Korea. 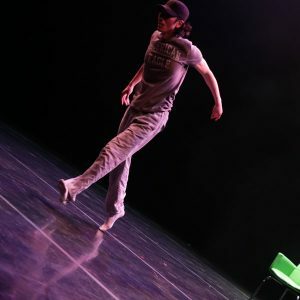 Renowned as the founder of the contemporary dance scene in Lebanon, Omar Rajeh entwines in his work major social and political issues inspired by the everyday life of the city of Beirut where he lives. He is continuously questioning the individual presence and the physicality of ‘the body’ within a socio-political and human context. Omar Rajeh | Maqamat aims at establishing a platform for innovation, experimentation, and continuous development of the contemporary dance culture in Lebanon and the Arab Region. By introducing new ideas and concepts of dance and ‘the body’, the company anticipates a new phase of artistic and social productivity, creativity, modernization, and free expression. The company was founded by Omar Rajeh in Beirut in 2002. It quickly emerged as a central organization in the creation and development of contemporary dance in Lebanon. It has supported, produced, and presented works for local emerging artists. The troupe collaborates with artists from the whole region, Europ, and Asia. One of the most important achievements of the company was the creation of BIPOD – Beirut International Platform of Dance 14 years ago. Japanese choreographer Kenji Shinohe presents two solo dance performances related to the modern human life. In【K(-A-)O】, he explores how we express emotions with the keyboard symbols of the information era. What is hiding behind all the emoticons we exchange on a daily basis? Are virtual smiles honest? How can we get back our feelings? [LOVE] is a short story about before to start love. How can we love someone or ourselves without any originality? 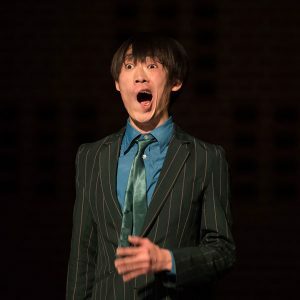 A dancer and choreographer, Kenji Shinohe graduated from the Nihon University College of Art and received a scholarship from that university to study at Germany’s Folkwang University of the Arts. 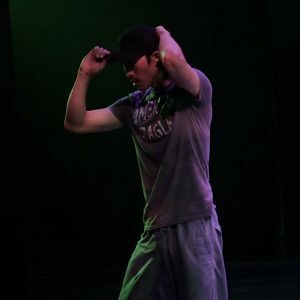 Currently living in Essen, he performs as a soloist and leads Die Tokyo Dance Crew and ELTEN. 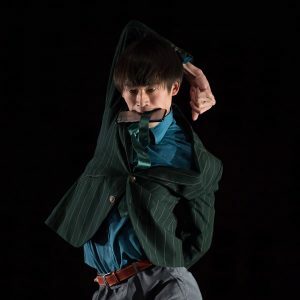 He has received the Grand Prize and Audience Award at the choreography competition at the International Dance Theater Festival in Germany and the Prime Minister Cup, the Sawamoto Tokumi Prize, and the SAF Special Prize in Japan. …On the internet, we can have a neutral face even if we are happy or sad during a communication, or pretend another emotion which we don’t feel in the present moment. But we send emoticons and symbols according to our own feelings. While doing so, all the infinite expressions and emotion of a human being become poorer and less complex. 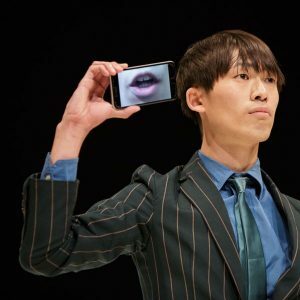 Kenji Shinohe goes on stage surrounded by regular objects – a T-shirt, a sign, a smartphone. He illustrates the dominant culture. He follows the others. Just a normal artist. Just a normal human being. Nothing original. How can he love something or somebody without being like everybody else? THE GREAT TAMER displays the idea that human life can be seen as a journey of discovery, an exploration for hidden treasure, an inner archaeological excavation for meaning. For nearly 3 decades, Dimitris Papaioannou has been staging new worlds described as a dreamlike absurd circus. Human bodies become battlegrounds, interacting with raw materials, fusing into hybrids, giving rise to optical illusions that make his work outstanding. Parental Guidance: this performance may be inappropriate for children under 14. 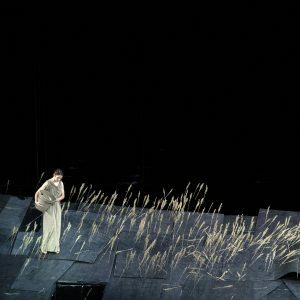 Papaioannou’s education as classical painter in fine arts gives his performances a strong visual feel, spectacular scenery, and memorable visuals. The talented Greek artist juggles with art history references, various practices of expression and performing, and ideas about our origins. His aim is to shed light on the sacred in the mundane. THE GREAT TAMER premiered in Onassis Cultural Centre – Athens (2017). Since then, the show has been presented in some of the most prestigious and notable festivals and theater venues on 2 continents, including in Paris, Madrid, Barcelona, Naples, Stockholm, Seoul and Taipei. Among many positive reviews, KATHIMERINI newspaper described THE GREAT TAMER as a “gallery of truth”, while El Periódico called it a “journey to the most hidden places of existence”. 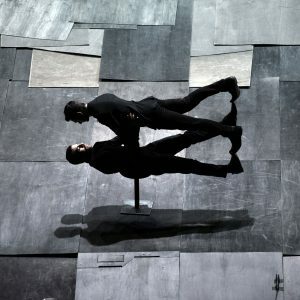 Papaioannou is the author of 25 productions ranging from mass spectacles with thousands of performers to intimate pieces. For nearly 3 decades, his surreal, spectacular and deep spectacles have been a paragon in the world of performing arts. 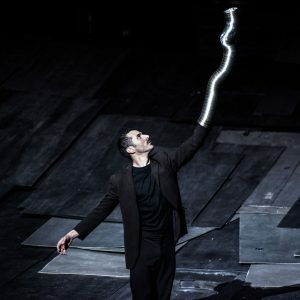 Papaioannou is an artist for every stage and have appeared in a wide variety of venues – from his famous underground squat theatre in Athens, to the ancient theatre in Epidaurus, and from Olympic stadiums to Théâtre de la Ville – Paris, and Teatro Olimpico in Vicenza. 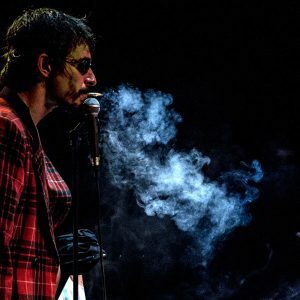 He is awarded numerous prizes, including the Special Award of European Theater Awards (2017) for his “total theater with an obvious maturity of expression”. In 2018, Dimitris will become the first artist to create a new, full-length work for Tanztheater Wuppertal Pina Bausch. 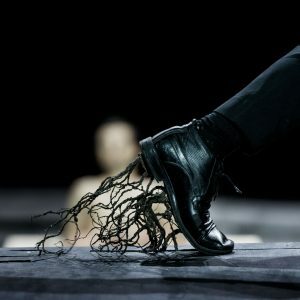 Born in Athens in 1964, Dimitris Papaioannou gained early recognition as a painter and comics artist, before his focus shifted to the performing arts, as director, choreographer, performer, and designer of sets, costumes, makeup, and lighting. He was a student of the iconic Greek painter Yannis Tsarouchis before studying at the Athens School of Fine Arts. 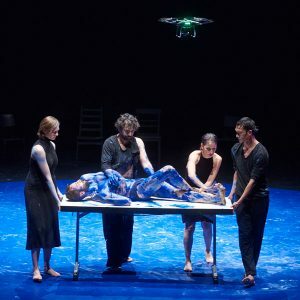 In 1986, he formed Edafos Dance Theatre as an initial vehicle for his original stage productions, hybrids of physical theatre, experimental dance, and performance art. Originating in the underground scene, the company challenged perceptions and gained an expanding number of dedicated followers. MEDEA (1993) marked the company’s transition to big theatres and is considered its iconic work. The Edafos company spanned 17 years, to 2002, and set its indelible stamp on the arts scene in Greece. Papaioannou became widely known in 2004, as the creator of the Opening and Closing Ceremonies of the ATHENS 2004 Olympic Games. In 2006, with his production ‘2’, he found himself in the odd position of creating avant-garde works in major theatres in Athens. The works enjoyed record-breaking long runs, with over 100.000 tickets sold. In 2009, he began using this platform to create theatrical experiments on a large scale: NOWHERE (2009) for the inauguration of the renovated Greek National Theatre and INSIDE (2011) for the Pallas Theater. 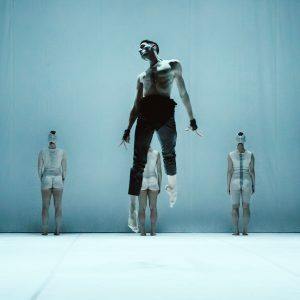 In 2012, stripping down his work to bare essentials, he created PRIMAL MATTER for the Athens Festival, with him back on stage after a ten-year absence. On the same quest for simplicity, he created STILL LIFE (2014), the first work that toured extensively in Europe, South America, Asia, and Australia. In 2015, he created the Opening Ceremony for the First European Games in Baku. In 2017, he created THE GREAT TAMER, his first international co-commissioned work with ten co-producers, including the Festival d’Avignon. THE GREAT TAMER is on an international tour, scheduled until 2019. Don’t underestimate the night. It is more vivid than you imagine. Anything can happen during the night. Anywhere. Outskirts, wetlands, non-places beyond the suburbs. Debris, wastes, splinters. Spaces of all kinds of castaways. The extreme tension of a black hole. The wild and chaotic energy. Emotions ready to explode… Limit, challenge, overcoming. Excess, intensity, release. Flat tires. Bodies with mouths, uncertain ground, wing vibrations. In NIGHT, a trio of men and a DJ step into the dark territories in search of new clarities. 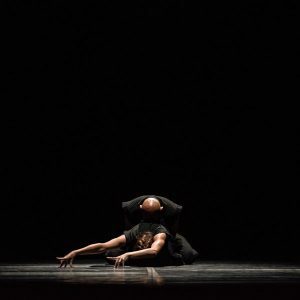 This intensely physical and emotional dance in dialogue with live music is questioning our language and aesthetics, digging into the ground of improvisation and exploding unexpectedly onstage. It is in the night when seeds of creativity grow best. It is the night where the famous poet Al Berto found the truth of writing. The dancers at first intended to praise his poems – cities’ undergrounds, the dimensions of his universe, the special light and clarity that only the awaken one could see. But then the night took them on another road. NIGHT is not suitable for children under 16 years of age. We are facing an aesthetic and poetic turn of Circolando, however, both the use of scenic materials as the meticulous lighting, the extraordinary musical score and the scene plays show us an extraordinary job, supported by an intense physicality and body language. The dramatic intensity is present all through the work, but there are moments that disturb us to the limit. Circolando is a transdisciplinary artistic company founded by André Braga and Cláudia Figueiredo in 1999. Their productions combine dance, circus, and theater, with strong input from other creation fields: poetry, visual arts, music, video. The creators’ initial affinity to circus lays within the name of the company. Today, what dominates in their works is the circle and the act of circulating – the choice to make our way in the frontier spaces. Circolando is settled in the former power plant of Freixo, Porto, current functioning as Support Centre for the Creation of Cultural Enterprises (CACE Cultural do Porto). The company is also regularly hosting artistic creations residences and training programs in and out of doors. We think that we defeated nature and our animal instincts. That we are the most supreme of all living species. That we top the food chain. The stronger one always wins, right? Dictating in our comfort zone, we no longer find space and time to reach what always brings us peace. It turned out that we ut off the fundamental relationship with the rest of living word. In ATMA, animals and humans become a single creature with the ability to constantly change its forms. It tells us stories about survival, vulnerabilities and the primal desire to dominate. Merging their bodies, two artists will present the metamorphosis of a beetle, the wisdom of a sacred elephant, ancient totem animals used for shamanism, and a snow leopard (Panthera uncia) coming to life by the Chinese martial art Wing Chun. Firstly, the leopard will be chasing a blue sheep in the mountains. Secondly, the beast will be chased by a hunter who wants a trophy to hang on his wall a fur to wear. ATMA is a demonstration of the human race’s behavior towards its environment, along with the painful reality of humans exploiting the Earth. 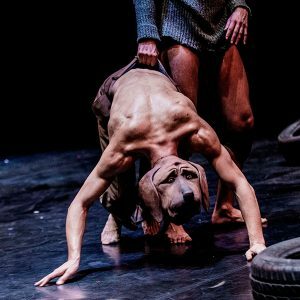 Rising Greek dancers Danae Dimitriadi and Dionysios Alamanos are taking us to a dream-like space where the human superiority over animals does not exist. This might be a utopia, but these bright dancers invite us at least to imagine it. What if it was true? 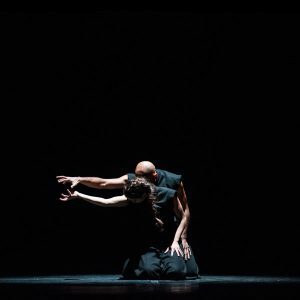 ATMA is the first full-evening production choreographed by Danae Dimitriadi and Dionysios Alamanos. It is a development of their ten-minutes duet with the same name completed in 2016 and toured around Greece and in several international festivals. Danae and Dionysios are two emerging Greek artists highly concerned by the future of the Earth. 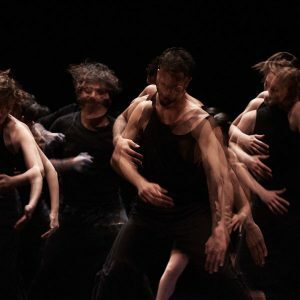 Their work brings together contemporary dance language, Greek inspirational aesthetics and powerful messages about the necessity of humanity to feel more concerned and act in the future. Led by strong convictions in their work, Danae and Dionysios are soon expected to stand out among the brightest Greek artists of their generation. Alamanos has also performed an excerpt of Akram Khan’s Vertical Road’. He is currently touring with Akram Khan Company and Sue Buckmaster’s production Chotto Desh’. 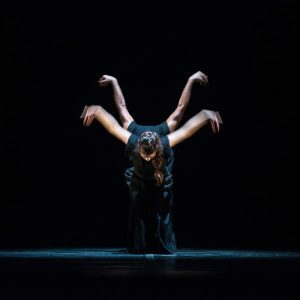 Born in Athens, Greece, and graduated from the State School of Dance, Danae danced as a member of Hellenic Dance Company for the production Open Frontiers’ at the Athens Concert Hall and at the Athens and Epidaurus Festival in choreographies by Akram Khan, Anton Lachky and Martha Graham. In 2014 she also took part in Panorama ’which was presented at the New York City Halland at Odeon Herodes Atticus in cooperation with Martha Graham Dance Company. Furthermore, Danae has been taught repertories such as Kaash’ and iTMOi’ in London. During 2016 and 2017, she joined the company ZfinMalta Ensemble. The night will include [SAL] of Kim, Jin A and A FIRST MEET of Lee, In Soo. Both shows are with a single ticket and their total duration is 60 minutes. There will be an intermission between them but guests are not encouraged to leave their seats. A violent energy belching from others, those piercers comes around me again. The thorns sprouting from you, within you, get sharpened fiercely more and more as they protest to the world. [SAL] is a miniature inspired by the traditional Korean dance Salp’uri. Performed and improved for many centuries, this dance is aimed at chasing demons and evil energy away and at bringing inner peace. Salp’uri is considered today as one of the most significant and remarkable forms of Korean dance. [SAL] is performed by three Korean dancers. The piece impresses with aesthetical costumes and movements. Kim, Jin A is a longstanding member of Cheonan City Dance Company in Cheonan, South Korea. She graduates from Dankook University with a PHD, and currently teaches classes there, as well as in the Seoul Arts College. JuBin Company is a multi-ethnic creative group of professionals from a variety of dance backgrounds collaborating with photography and Visual communications, etc. based on the movements of Korean traditional dance. 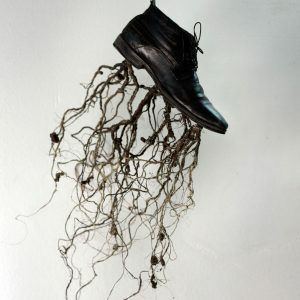 Kim, Ju-bin was awarded the [ACT-BAD PRIZE] at the ‘ACT Festival’ in Bilbao, Spain in 2016, and is active in various international theater projects, as well as visual communication projects involving photography and video arts. Everything in my life is started by ‘me’. When I concede and admit me as it is. That is the first day of valuable life. In A FIRST MEET an artist meets himself for the first time once again. This may seem easy, but is it really so? Lee, In Soo, with his precise technique, is one of the most popular Korean choreographers. His works have been presented in Festival Fringe (Edinborough), Internationale Tanzmesse NRW (Dusseldorf), Daegu Dance Festival (Daegu, South Korea). The solo performance A FIRST MEET has been presented in Seoul, South Korea; Beijing, China; Hungary; The Czech Republic and other places. The ‘SCF Prize(1st Prize)’ in Professional (Solo&Duet) and the ‘SCF Dance Critic Prize’ at the Seoul International Choreography Festival, 2017. Born in 1982, Lee, In Soo graduates from the Korea national university of arts, where he has been teaching dance in the past 8 years. In 2003 and 2004 he is part of the dance group Mio Greco & Pc from the Netherlands and takes part in multiple international festivals. After his return to Korea, he joins the group LDP (Laboratory Dance Project), where he works until 2013. Today, he is the artistic director of the contemporary dance company Edx2. His professional career starts with street dance. However, he is not limited to one art form and also incorporates contemporary dance, acting, pantomime, and other arts in his work. His works are descriptive but also emotional. They tell stories through dramatic techniques and movement of fusion and segregation of the body. 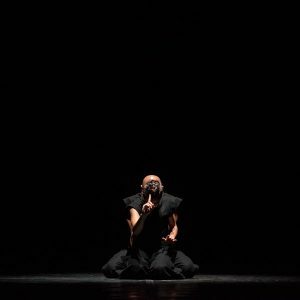 Known for the high quality of his choreography, Lee In Soo is contributing to the cultural diversity on the contemporary dance scene in more than 40 cities and 25 countries around the world. In the near years, the company has won prestigious awards, among which the Grand prize and Best Choreography Prize at the 23rd Daegu Dance Festival (2013) and the Gold Prize and Best Popularity Prize at the 2nd Beijing International Ballet and Choreography Competition (2011). The word “godos” has disappeared from daily Lithuanian vocabulary. It’s time to bring it back to life through the art of dance. 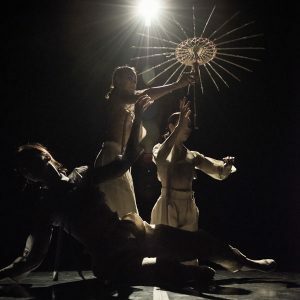 GODOS, created by Lithuanian and Norwegian choreographers, is a tangle of past, present, and future – a world where feminine sensuality, secret mythological creatures, and futuristic visions meet. AURA Dance Theatre and famous Lithuanian choreographer Birutė Letukaitė reflect on „godos” through recreating popular myths and legends from the Baltic country. What is hiding in the fur of a bewitched werewolf? What spells do contemporary hags use? Who brings the luck if we don’t believe in brownies anymore? Dancers move in patterns, forms and the rhythm that reminds the clattering of weaving looms. Threads are being weaved as colorful as life, full of thoughts about who we are today and who we will become tomorrow. 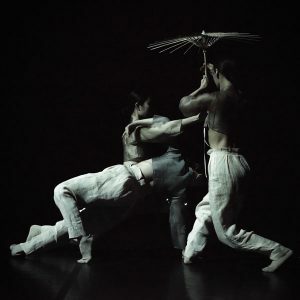 Norwegian choreographers Anne Ekenes and Pia Holden (Panta Rei Dance Theatre) take inspiration from the interpretation of Godos as the song of the heart. The music for the piece is composed by Antanas Jasenka – a famous contemporary composer in Lithuania, working with best theatre directors in Lithuania and abroad. GODOS is part of FOCUS LITHUANIA of the ONE DANCE WEEK festival – a program of 3 contemporary dance pieces from Lithuania, curated by Gintarė Masteikaitė from Lietuvos šokio informacijos centras. The other shows are GAME OVER by LOW AIR Vilnius city dance theater (October 13) and CONTEMPORARY? by Menų spaustuvė/ Arts Printing House (October 14). Birutė Letukaitė – two Golden Stage Cross awards – for choreography and for significant input to the contemporary dance art of Lithuania. AURA Dance Theatre promotes the expression of contemporary dance in Lithuania. Dance studio “Aura” was established on Birutė Letukaitė initiative in 1980 and was registered as Kaunas City Theatre in 1995. During the years of its existence, the theatre created and shaped the face of Lithuanian contemporary dance with more than 50 domestic and international awards up to date. The studio has trained a great number of professional dancers who are well-known worldwide. It is still directed by the prominent choreographer Birutė Letukaitė. AURA is constantly working on various international projects, cooperates with foreign and Lithuanian choreographers and artists of various fields. For 27 years, AURA Dance Theatre has been organizing the International dance festival “Aura” in Kaunas. It is the oldest as well as one of the biggest dance festivals in Lithuania. The event has eventually become an integral part of Kaunas city culture. The festival is drawing local audiences, dance professionals and producers from the whole country, the Baltic region and abroad. The festival is sponsored by Lithuanian Ministry of Culture and Kaunas City Municipality. It’s been a century since the writer who created the rules of games with imagination Julio Cortázar was born. Today magical realism has taken hold of many territories beyond books with computer games and performing arts as two of its playgrounds. 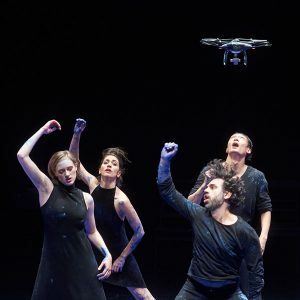 LOW AIR Vilnius city dance theater unites both in their visual dance performance GAME OVER inspired by Cortázar’s vivid literary legacy. The outcome is a dance performance with visual effects and live music that revolves around game perspective. Passing levels up, two dancers face unexpected challenges between fiction and reality. Here comes the blue pullover trap – a reference to Cortázar’s famous story of a man trapped within his favorite winter cloth. With minimalist style and contrast action supported by drums and electronic music, GAME OVER invites the audience to witness a collision of reality and dreams. Anything can happen. If this game is on, will you join in? GAME OVER is part of FOCUS LITHUANIA of the ONE DANCE WEEK festival – a program of 3 contemporary dance pieces from Lithuania, curated by Gintarė Masteikaitė from Lietuvos šokio informacijos centras. The other shows are GODOS by Šokio Teatras Aura (October 12) and CONTEMPORARY? by Menų spaustuvė/ Arts Printing House (October 14). Golden Stage Cross award – Best Dance Piece of the Year 2016. LOW AIR is an innovative, younger Lithuanian generation dance theatre. Fusing urban and contemporary dance elements in their work, the company brings unique dance forms and synthesis into contemporary Lithuanian dance landscape. 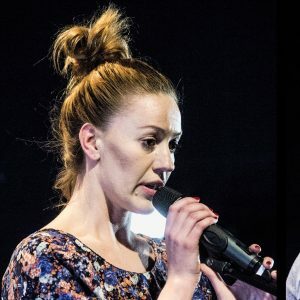 Choreographers Laurynas Zakevicius and Airida Gudaite established the first professional urban dance theatre in Lithuania, “Low Air”, in order to uncover the artistic potential of urban dance styles and introduce it to theatre lovers across the country. LOW AIR debuted with their first dance performance Feel Link in the Arts Printing House | Young Stage Artists’ program Open Space back in 2011. 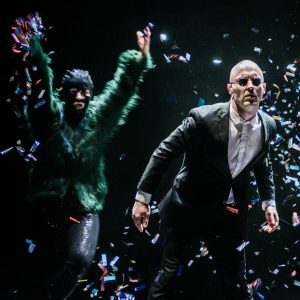 The Ensemble-debut showed a reflection on the impalpability on feelings in a modern society and were nominated for the highest performing arts award in Lithuania – Golden Stage Cross. 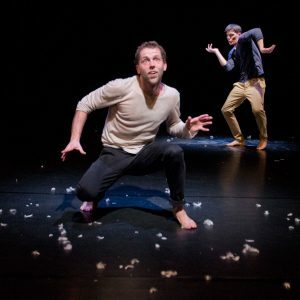 In 2014 Airida and Laurynas won the Golden Stage Cross Award as best choreographers for their second piece “Home Trip” that presents a fusion of dance, theatre, music, and theatre. Airida Gudaite is a professional dance teacher. She gained her bachelor’s and master’s degree in dance education in Lithuanian University of Educational Sciences. 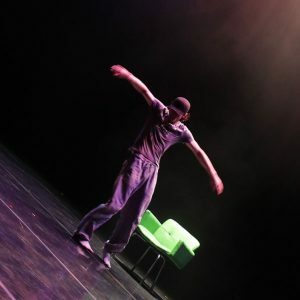 Laurynas Zakevicius is a social pedagogue who uses the artistic potential of dance in resocialization of young souls. The more you look at it, the more you doubt about it. What is contemporary dance really? The three performers in FOCUS LITHUANIA: CONTEMPORARY? focus ironically on the processes of dance making, the guild and the contemporary stage in their home country Lithuania. From the first choreography intention to minor consume details, we will see what usually stays behind the curtain. Rehearsal room routine, cliché movements, boring conversations, funny dialogs… all on target, all presented with a great sense of humor. For that irony is an art itself. It just needs to be spotted. What does a piece consist of? Which objects are necessary? Does audience understand the meaning? Do we need to explain it to the audience? The best answer could be given by dancers themselves. Not by talking, but by acting. Not by demonstrating dance techniques and skills, but by making fun out of it. She is a dancer, actor, and teacher who recently and very successfully turned into choreographer as well. In 2009, Agnė received her professional degree at The Lithuanian Theatre and Music Academy. Since then, she has been participating in various dance training and still improving her professional skills in different workshops. As one of the most famous Lithuanian dancers, teacher and choreographer Mantas Stabačinskas has started his professional career 16 years ago. He created over 30 roles and collaborated with many different choreographers from all over the world. For eleven years Mantas has been a part of Aura Dance Theater (Lithuania) and now he is a freelance dancer, teacher, and choreographer. Well known Lithuanian theater and television actor, Paulius Tamolė is a dancer who recently debuted as a choreographer as well. He has created over 10 roles in different stages and collaborated with the well-known theater directors such as Jonas Vaitkus, Oskaras Korsunovas, Jana Ross and etc. Paulius began his professional acting career at the National Drama Theater (Lithuania) in 2005. Three years later, Paulius has been nominated for the theater award as the Best Young Artists of the year. Together with his longtime stage partners Mantas, and Agnė he participated in the program for young artists – “Open Stage’13”, hosted by Arts Printing House and presented the ironic contemporary dance performance “Contemporary?”. Recently the piece has been presented in over 10 European countries as well as in China.